Facing an OUI Charge in Massachusetts aims to help you deal with what is likely the one of the most difficult experiences of your life: a drunk driving charge. Drunk driving is a charge that many good people face and eventually overcome, getting their life back on track. This essential resource is designed to answer your questions about all aspects of this difficult experience. Written by an experienced attorney, this book will help you understand the court process, license consequences, and methods used to defend an OUI case in court. Once you understand the law, you can make informed decisions about which lawyer to hire and whether to contest the case at trial or resolve the case by way of a plea agreement. The ultimate goal is to educate you as to the defenses in your case, so you understand how these cases are won every day in court, and how you could be found not guilty at trial. 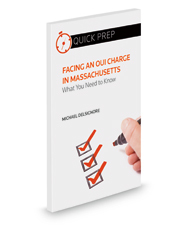 Facing an OUI Charge in Massachusetts outlines the consequences of an OUI conviction, flaws with police field sobriety testing, errors in breath testing, and legal defenses to an OUI charge.